The exclusive SONOR Artist Snare series combines the experience of the world’s most talented drummers with SONOR’s vast percussion instrument manufacturing expertise. This partnership has produced unparalleled snare drum models which meet even the most stringent demands. From brass to steel or bronze, from maple to beech and birch, each and every Artist Snare Drum is a masterpiece in its own right. During the development process, design is as integral to the final product as sound quality. This attention to detail gives each Artist Snare Drum its own unmistakable character. See for yourself on the following pages, or visit your SONOR instrument dealer to experience the tremendous quality of SONOR Artist Snares. 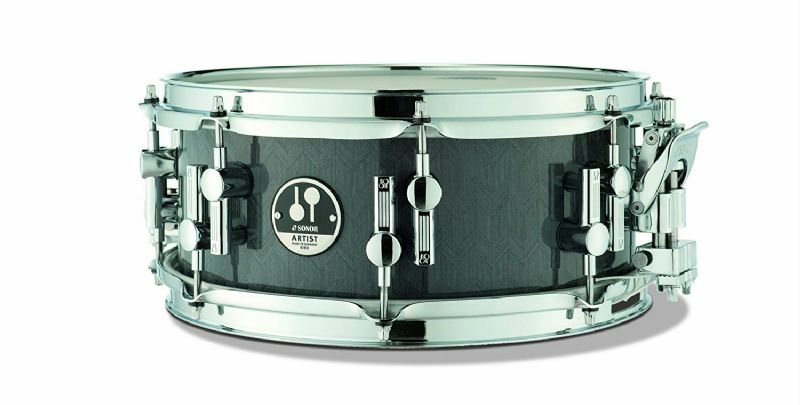 AS 12 1205 AD A 12 ply Birch shell with 12" x 5" size gives this snare drum a crisp, bright sound with plenty of attack. Whether using it as the main drum or as a side snare drum, the high pitched rim shots and sensitive response of the stainless steel wires ensure perfect sound performance. Ideal for the short breaks in drum ’n’ bass, hip-hop or electronic pop.